With just five days left until Universal Pictures and Legendary Pictures' Seventh Son hits theaters, the studios have released a new trailer that debuted during NBC's coverage of Super Bowl XLIX. 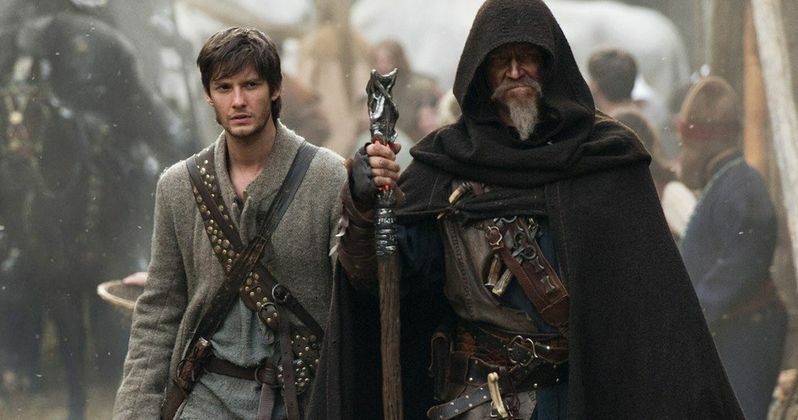 In a time of enchantments when legends and magic collide, the sole remaining warrior of a mystical order (Oscar winner Jeff Bridges) travels to find a prophesized hero born with incredible powers, the last Seventh Son (Ben Barnes). Torn from his quiet life as a farmhand, the unlikely young hero embarks on a daring adventure with his battle-hardened mentor to vanquish a dark queen (Julianne Moore) and the army of supernatural assassins she has dispatched against their kingdom. Olivia Williams, Kit Harington, Antje Traue, Alicia Vikander and Djimon Hounsou rounds out the supporting cast for this upcoming action-adventure, which was originally scheduled for release last year before it was delayed to February 6. Sergey Bodrov directed Seventh Son from a screenplay by Charles Leavitt and Steven Knight and a screen story by Matt Greenberg, based on the book series "The Last Apprentice" by Joseph Delaney. In addition to the Super Bowl trailer, Universal and Legendary have also debuted new concept art images from Seventh Son, which you can check out below the trailer. What do you think about the footage and concept art? Will you check out Seventh Son when it hits theaters nationwide on February 6? Chime in with your thoughts below, and stay tuned for more footage from this adventure.